Vice Chancellor Andrew Vann outlines a way research funding for universities can be used to benefit all Australians (not just the Go8) and how funding for the university sector could be sustainable without fee deregulation. 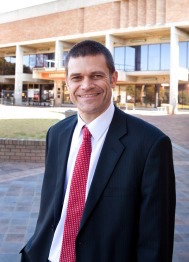 As Vice-Chancellor of Charles Sturt University, a regional university in NSW, I have some things to say about the recent developments in higher education. Like many others I welcome the decision by the Turnbull Government to delay any cuts to university funding and to consult widely on policy for higher education. I also need to put on the record that I strongly oppose the proposal recently made by the Group of Eight universities for research funding to be tied to the Excellence in Research for Australia (ERA) assessment, which is largely based on research publications and research income figures. Current policy already directs most research funding towards the Group of Eight and we need to ensure that universities such as Charles Sturt, where we focus on applied research with practical benefits can also succeed. I believe it is not in the national interest to go down this path. A succession of studies and reviews has concluded that the university sector is underfunded and fee deregulation would be one way to address this. There is already fee deregulation for international and domestic postgraduate students, so it is difficult to argue in principle that deregulation is fundamentally a bad thing. A cut in government funding to universities may also have helped the federal government with its budget problems but I don’t think it shows good long-term thinking. There is, justifiably, strong opposition within the community for full fee deregulation. Impacts from the current package, now under review, would be highly inequitable. This is particularly troubling for Charles Sturt University students. I am thinking of those studying the agriculture and veterinary science courses specifically because costs for these courses would have risen considerably. Regional students in all courses of study are already concerned about the costs of education, both in terms of the debt burden and living costs while they study. We also know that working mature-aged students have been more price-sensitive in other countries. Many mature-aged students in Australia are using the education available in regional universities as an opportunity to relaunch their careers. We need to work our way towards a sustainable funding future for higher education and I believe this can be done. For universities primarily concerned with the various world university rankings there is already a bias against applied research with local benefit. That’s because the reporting and evaluation systems, including the ERA ratings to which the Group of Eight wants even greater attention paid, are largely based on international research publications and research income figures. This creates an aversion to taking research to the next step of intellectual property development and transfer, because it risks limiting publication and other traditional measures of success. I believe universities have a responsibility to ensure research meets the genuine needs of the nation and its industries. There needs to be active collaboration between universities, local communities and industries. As I see it, to do this we should firstly better align competitive grants with industry needs through increased industry representation in assessment and review. There is also the opportunity to broaden the rural research and development corporation model of co-funding to other sectors. This model allows industry to have a say in guiding research priorities and directing public investment. Equally important is encouraging people currently working in industry to undertake higher degrees by research and supporting entrepreneurial skills in for all students. These people are already keenly aware of their industry’s challenges and will apply that approach in research. They are also more likely to be able to apply the entrepreneurial skills that are needed to deliver successful commercialisation of research. Federal government funding for university research should benefit all Australians and not be reduced to a factor in a world rankings race for a small number of universities. How can we achieve sustainable funding? If we want sustainable funding for higher education, it has to come from somewhere. The HELP income contingent loans scheme, recovered through the taxation system, is effectively a graduate tax. If we don’t want the tax burden to fall more heavily on graduates, by increasing student fees, there needs to be another plan. Labor’s recent policy announcement commits to legislating per-student funding. It proposes to fund this through taxes on multinational companies, superannuation and abolishing the Emissions Reduction Fund. It is not yet clear what will emerge from the Government if the 20% cuts are off the table. So it seems at the national level we might now have a debate about sustainable expenditure and taxation. In my view, this is the mature political debate that has been missing through most of the last decade. Regional universities have a special mission to work with their communities and industries to help them grow and innovate. Charles Sturt University makes a huge contribution to the regional and rural workforce. I believe for the health of our communities we cannot afford to see regional students priced out of education or regional universities overlooked for research funding. Regional universities are here, on the ground, and the type of engagement we offer can’t be replaced from the capital cities. Whatever direction is taken in fees and funding, it needs to allow regional universities to continue with their research and engagement mission. Higher education provides a strong economic return and allows nations to flourish and prosper. If Australia is going to put this as its prime objective, regional universities must play a pivotal role. Professor Andrew Vann trained as a civil engineer and worked in engineering consultancy before completing a PhD in the Civil Engineering Systems Group at University of Bristol in 1994. What a great posting. Thank you. The idea that the Group of 8 is to control most research funding is crazy as it creates religions, sects and prevents an even growth across the sector. The truth is that while some researchers in the Group of 8, without a doubt, do some good work, this does not mean all of them do or that others, outside the Group, do not do outstanding work. The developments in every field testify to the dangers of policies which create gods and which stifle growth. Also, the idea that international impact is the key is a nonsense invented by someone who did not appreciate that Google cannot turn “AU intellectual work” into “US intellectual work”, as it can do with dollars. Local research is about impact on local conditions. It is therefore informed by thinking directed to impact on the practices and assumptions of the region. The idea that all this is transferable to other regions of the world may be true but why should we now engage in translating what we do here through the language and conditions that are applicable, say, to the US without actually being directly involved in the practices of that country? Research in quantum physics may well be more international, I do not know, but some of us are looking at the ground, and the ground does have a local, not generic, flavour.